Video – Introduction to the Book: Click Here. There’s a problem today with patents and patent licensing, and it has to do with what is called the “Network Economy”. That’s a phrase that means that many people and companies contribute to make a certain product or system – it is the network that produces the result. It’s been estimated, for example, that perhaps as many as 250,000 patents contribute the technology in a smart phone. How can a manufacturer of a smart phone deal with so many patents? (3) Obtaining the approval of the antitrust or competition law authorities in the United States, Europe, and Japan. 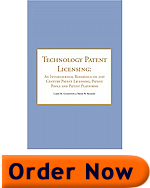 The book concludes with this history of the Wideband CDMA patent pool, and sets forth ten steps that are required for the creation of any patent pool or other joint effort by multiple companies to license packages of patents. (4) Creating a pool or other joint effort to license patents. Larry M. Goldstein is a U.S. patent lawyer specializing in Information & Communication Technologies. He evaluates patent quality, manages patent portfolios, and creates patent harvesting programs for high-tech companies. He helped establish the patent pool for 3G W-CDMA technology, specifically in creating the methodology for determining the essentiality of patents to the W-CDMA technical standard, preparing licensing agreements to implement FRAND terms & conditions, and obtaining the approval of the Antitrust Division of the United States Department of Justice. 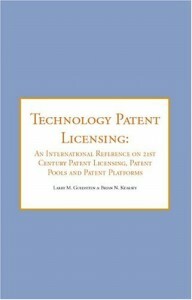 He is a co-author of the book Technology Patent Licensing: An International Reference on 21st Century Patent Licensing, Patent Pools and Patent Platforms. Mr. Goldstein holds a B.A. from Harvard College, an MBA from the Kellogg School of Management at Northwestern University, and a J.D. from the University of Chicago Law School. His web site is www.2f1.1be.myftpupload.com/.